There are now 41 glyphosate-resistant weeds in the world. Seventeen of those occur in the United States. There are six species in Canada, and four of those occur in Ontario. In Ontario, glyphosate-resistant giant ragweed was confirmed in 2008, Canada fleabane in 2010, common ragweed in 2011 and waterhemp in 2014. Soybeans sprayed with glyphosate There are now 41 glyphosate-resistant weeds in the world. 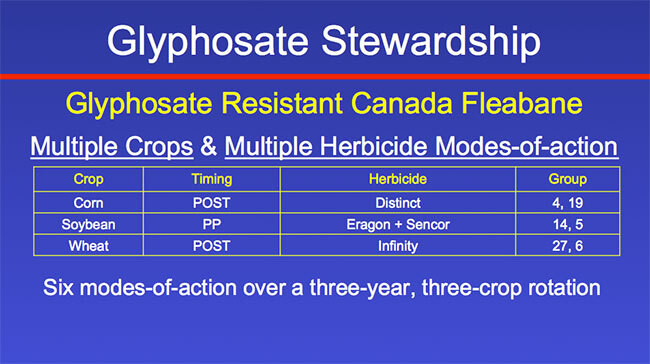 The glyphosate-resistant Canada fleabane problem started in 2010. I remember the day quite well. I received an email from an ag retailer in southwestern Ontario. They had applied glyphosate at twice the label rate as a burndown in a soybean field, and had excellent burndown, but there were individual plants that were not controlled. The weed escapes didn’t look like a typical fleabane plant. Typically, fleabane has one stem per plant, and in this biotype the growing point was burnt out with glyphosate but the plant regrew with multiple stems. Joe Vink, a masters’ student at the University of Guelph, started research on glyphosate-resistant Canada fleabane in 2010. The susceptible biotype was controlled with Roundup Weathermax at 0.33 and 0.67 litres per acre. In contrast, the resistant biotype was not controlled and there was no symptomology at all. The plants were highly resistant to glyphosate. In 2010 there were eight fields in Essex County with glyphosate-resistant Canada fleabane. Five of those fields were near Leamington, Ont., and three of those fields were adjacent to the Michigan border near Amherstburg, Ont. The following year, glyphosate-resistant Canada fleabane was found in five additional counties in Ontario. In 2012, it was found in eight counties. In 2013 it was found on the east side of Toronto. In 2014 it was in 28 counties in Ontario. And in 2015 glyphosate-resistant Canada fleabane was in 30 counties in Ontario. The weed moved more than 800 kilometres over a five-year period, and now it’s found right from the southwestern part of the province to the county adjacent to the Quebec border. It’s occurring at densities that are causing significant yield losses in corn, soybean, and wheat. Ontario farmers consider glyphosate-resistant Canada fleabane to be the number-one weed management issue in the province. However, the problem has become even more challenging for Ontario farmers. There now is multiple resistant Canada fleabane. On a farm at Mull, Ont., we found Canada fleabane resistant to glyphosate and Broadstrike RC (Group 2). So we screened all of the weed samples in our seed storage at Ridgetown Campus, and 23 of the 30 counties with have glyphosate-resistant Canada fleabane also have Group 2-resistant Canada fleabane. This makes the problem much more challenging for Ontario farmers. The first experiment that we looked at in corn is what farmers can add to pre-plant burndown to control glyphosate-resistant Canada fleabane. Glyphosate was tank mixed with atrazine, Broadstrike, Primextra, or Converge, and you can see all of those provided less than 70 per cent control. However, Banvel, Callisto plus atrazine, Integrity or Marksman, all provided greater than 90 per cent control. The best treatment was Marksman, which is a combination of dicamba and atrazine. We did a parallel study to find out what a farmer can spray post-emergence in corn. Roundup, atrazine, Permit, Vios, Liberty, Armezon plus atrazine, 2,4-D, Peak plus Banvel, and Callisto plus atrazine all provided less than 90 per cent control. But once again, we do have some good options in terms of managing this weed post-emergence in corn. The dicamba-based products – Distinct, Banvel, and Marksman – all provided greater than 90 per cent control. And really interesting to me, a very old herbicide called Pardner (bromoxynil) plus atrazine also provided greater than 90 per cent control. The most efficacious treatments were the dicamba-based herbicides, either Banvel or Marksman. So in terms of managing Canada fleabane in corn, we have some really good options. The real challenge in terms of managing glyphosate-resistant Canada fleabane in Ontario is in soybean. It is much harder to remove a dicot weed from a dicot crop than it is to remove a dicot weed from a monocot crop. We ran three parallel studies; in the first study we looked at what an Ontario farmer can add to glyphosate in his preplant burndown to control glyphosate-resistant Canada fleabane. We tank mixed Roundup with 2,4-D, Aim, Liberty, Gramoxone, Eragon, Integrity, FirstRate, Classic, Valtera, and Guardian Plus. None of those tank mixes provided 90 per cent control. The second study looked at soil-applied residual herbicides that provide both burndown and full season residual activity. We tank mixed Roundup with Classic, FirstRate, Lorox, Sencor, Broadstrike, Pursuit, Command, Fierce, Guardian Plus, and Conquest. None of those provided 90 per cent control. The third experiment looked at what herbicide could be added to glyphosate post-emergence to control glyphosate-resistant Canada fleabane in soybean. We tank mixed Roundup with Blazer, Reflex, Basagran, Pinnacle, Classic, FirstRate, Pursuit, Cleansweep, as well as Flexstar. None of those provided 90 per cent control. 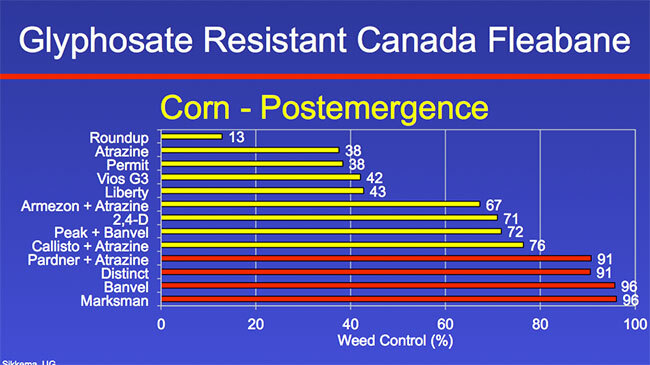 Our best treatment post-emergence tank-mix with glyphosate was FirstRate, and it provided 51 per cent control of glyphosate-resistant Canada fleabane, so that was very disappointing. These studies were done between 2011 and 2015 with every single broadleaf herbicide registered for weed control in soybean in Ontario, and not one of them provided 90 per cent control. Just so you can appreciate why I say 90 per cent control is important: in the fields with the heaviest weed pressure on commercial farms in Ontario, the highest density that we counted was 8,000 per square metre. So 90 per cent control of 8,000 still means you have 800 left per square metre and that is not nearly good enough. You are still going to have dramatic decreases in soybean yield. In our research, we’ve concluded that Roundup plus Eragon (Heat in Western Canada) applied preplant is the foundation for glyphosate-resistant Canada fleabane control. But, there’s a big “but” here – and that is the consistency of control. We did 84 studies with Roundup plus Eragon plus Merge as one of the treatments in those studies. In 54 per cent of those studies, Roundup plus Eragon plus Merge provided greater than 90-per-cent control. However, 46 per cent of the time it didn’t provide acceptable control. So we’ve concluded that Roundup plus Eragon, even though it’s our best treatment, does not provide consistent control. However, there’s a new player on the market. Roundup Ready Xtend Soybean was introduced in 2017. I used to think that dicamba was almost bulletproof in terms of the control of glyphosate-resistant Canada fleabane, but I was wrong. I looked at all of the studies that we’ve done over the years and found there was a rate response with dicamba for the control of glyphosate-resistant Canada fleabane. When dicamba was applied at 300 grams per hectare (330 millilitres of Xtendimax per acre), 450 grams and 600, there was a rate response moving from 80 to 88 to 94 per cent control. You need to use the higher rate of dicamba to get greater than 90 per cent control. However, in 2017 there was one field in Ontario with four different experiments sprayed on four different days with glyphosate plus dicamba. In all four experiments there were fleabane plants where the growing point was killed but the plant grew back with multiple stems that arose from axillary buds at the base of the plant. It wasn’t an environmental effect. I had never seen that in the first six years that I studied the control of fleabane with dicamba. So even dicamba is not perfect for the control of glyphosate-resistant Canada fleabane. 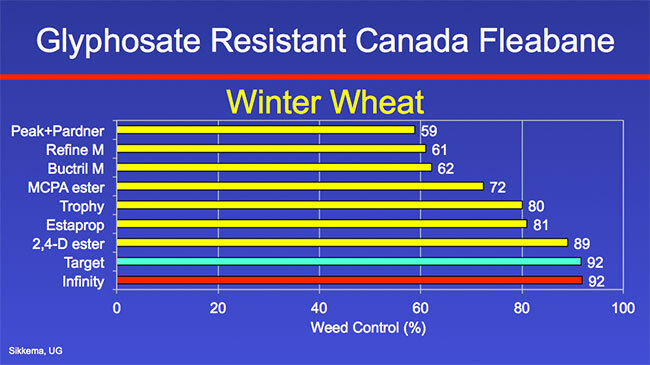 We studied the commonly used broadleaf herbicides in winter wheat in Ontario. Peak, Refine, Buctril, MCPA, Trophy, Estaprop, and 2,4-D ester provided less than 90 per cent control. Target provided 92 per cent control. However, I will never recommend Target for weed control in winter wheat because dicamba in Target is just simply too hard on the crop. We have had up to 25 bushel per acre yield losses where we include dicamba in our broadleaf herbicide in winter wheat. I think we’re down to essentially one herbicide to manage glyphosate-resistant Canada fleabane in winter wheat. Infinity (pyrasulfotole and bromoxynil) provided 92 per cent control. herbicide cost. If farmers are going to use my favourite tank mix, Roundup plus Eragon plus Sencor plus Merge, their burndown treatment goes from $5 an acre to $30 an acre. Their first two bushels of soybean that they produce is just to control this one weed on their farm. If you think that the first 40 bushels of soybean just go to cover your variable cost, and you have an average yield of 50, you’ve reduced your profitability by 20 per cent just because you have this weed on the farm. Can Ontario farmers eliminate this problem through good weed management? I would suggest that they can’t. Glyphosate-resistant Canada fleabane grows in non-crop areas. It has windblown seed. There’s an indefinite source of Canada fleabane seed. Ontario farmers will have to continue to manage this weed indefinitely into the future. North American corn and soybean farmers have indicated by their purchasing patterns that they value Roundup Ready crops and the use of glyphosate for weed control. In Ontario in 2017, 78 per cent of soybeans were seeded to Roundup Ready cultivars and 97 per cent of corn was seeded to our Roundup Ready hybrids. But I think that for farmers to continue to get benefit from this technology in the future it must be used less frequently or it must be used differently than it was in the past. If we continue to rely on glyphosate to the exclusion of other weed management practices, we will continue to select for glyphosate-resistant weeds in Ontario. In order to preserve the use of glyphosate for weed management I’m going to ask seven questions. Would you consider adding a non-Roundup Ready crop to your rotation or adding an additional non-Roundup Ready crop to your diversified crop rotation? In Ontario, there are lots of possibilities for adding diversity to your crop rotation including conventional corn, identity-preserved soybean, Xtend soybean not sprayed with glyphosate, cereals, dry beans or forages. There are lots of other cash generating crops that Ontario farmers could include in their rotation. The second question is would you consider applying multiple herbicide modes of action on every acre every year by using a two-pass program? We have lots of options of introducing diversity into our weed management programs. 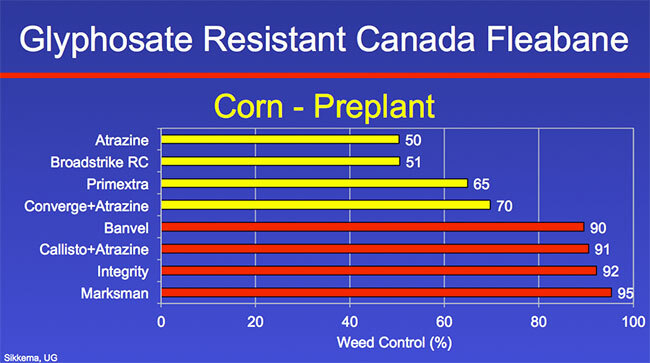 In corn we have excellent pre-emergence herbicides, such as Acuron, Converge, Engarde, Integrity, Lumax or Primextra. And in soybean you could use products like Boundary, Canopy, Conquest, Fierce, Freestyle, Integrity, Optill, Pursuit or TriActor. The third question is would you consider applying multiple herbicide modes of action on every acre, every year by adding a tank mix partner to Roundup applied post emergence? Once again we have lots of options. In corn you could use Banvel, Halex, Marksman, Vios, and in soybean it could be Classic, FirstRate, Flexstar or Pursuit. 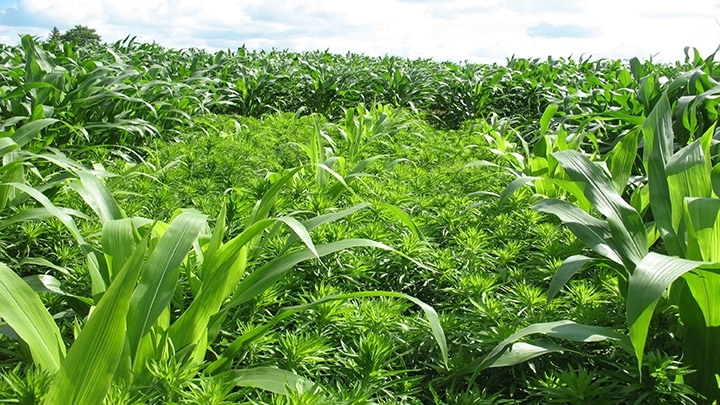 If you implemented those three strategies in a diversified crop rotation of corn, soybean and wheat, you would be using six different modes of action over your three-year, three-crop rotation. I can assure you, with that kind of diversity in your weed management program, you would reduce the selection intensity for glyphosate-resistant weeds. The fourth question is would you consider strategically incorporating some of the alternate or new technologies when they become available rather than relying on Roundup Ready exclusively? In corn, Liberty Link corn and Enlist corn are available. In soybean, Liberty Link or Roundup Ready Xtend soybean are registered. And it’s expected that Enlist and Balance soybean will be available in the near future. Fifth question is would you consider incorporating tillage at strategic points in your diversified crop rotation? I’m not a big tillage guy, I think we have to do everything we can to conserve that topsoil resource for future generations. However, tillage may be one component of a long-term, diversified weed management program. Number six is would you consider seeding a cover crop after winter wheat harvest to reduce Canada fleabane emergence? My brother grows winter wheat. The day that he takes his wheat off, he seeds a cover crop. Fleabane doesn’t establish very well if you have a really dense cover crop. You can approach 100-per-cent control of fleabane in the subsequent corn crop the following summer by planting a dense cover crop after combining winter wheat. And the last question is would you consider making near-perfect weed control your objective in your corn, soybean, and wheat rotation? We simply have to reduce weed seed return to the soil or we’re just going to perpetuate this problem in the future. I think with the tools we have in 2018 we can do that. My hope is that Ontario farmers will implement weed management practices that limit the selection of additional glyphosate-resistant weeds. This will ensure the usefulness of glyphosate and Roundup Ready crops for many years in the future. I think glyphosate’s a fantastic herbicide, and I think it’s incumbent on all of us, whether we’re in research, if we’re making recommendations to farmers, or farmers to ensure that we use this technology properly so that future farmers will get the same benefit as what farmers did in the past 20 years. If you do not have glyphosate resistance on your farm yet, adopt integrated weed management now and use glyphosate judiciously at strategic points in your long-term crop rotation.